Clyde Valley H.O.G. is proud to offer a wide range of official H.O.G. merchandise. Let people know you're a Harley Owner! We are currently working on a new Catalogue which will containing all of the new H.O.G merchandise available to all Chapter members. Unfortunately HOG UK are in the process of changing licenced supplier which is effecting the supply change and making some items difficult to get. 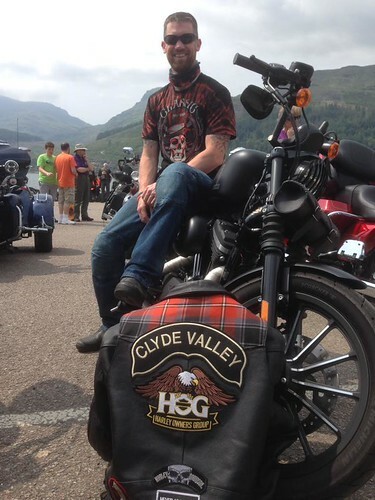 In the mean time if there is anything you are looking for, Clyde Valley Rocker or HOG Eagle patches, please contact one of the committee (See contacts Page) and we will do our best to get what you want. Our Chapter Tartan was designed with the help of Bathgate Kilt Studio and was registered through the Scottish Register of Tartans (STA ref:- 7103) on the 1st February 2007. Bathgate Kilt Studio is the only supplier for this tartan and will be happy to design a hand sewn kilt, waistcoat or trews for a current registered Chapter member. If you are interested in having any of these items made please ask either the Director, Assistant Director or Secretary to send an authorisation request to Bathgate Kilt Studio. The kilt studio will then arrange an appointment directly with the member and will be happy to discuss costs and availablity during this meeting.